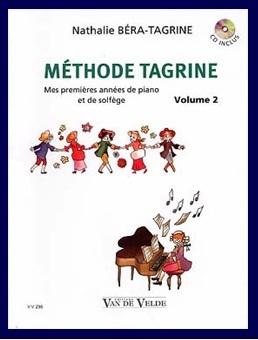 If you are searching for a new piano method to suggest to your music classroom, we recommend that you have a look at one published by Editions Van de Velde : ‘Méthode Tagrine’. The first volume was edited in 2012 and had success. Now, for pupils who are a little more advanced, here is the second one. It will help them to learn piano with joy, diligence and keen interest, as says the author, Nathalie Béra-Tagrine, who also revealed to us that she has conceived and written this method with Pizzicato music composition and notation software! Isn’t it real news ? That success shows – if it is still necessary – the qualities of Pizzicato as an exhaustive and smart music notation software. The one which can help you to plan your own professional publishing project and to be taken seriously by a music publisher. And then, you become someone that students and even other teachers like to follow, founding your own ‘tribe’ or if you prefer ‘augmented classroom’. And also such a publication shows that, far away from excluding each other, the professional music publisher and the music software developer become more and more linked through different types of musicians and teachers : professors in their own classrooms, professors who want to share ‘beyond academia’, performers, composers.